I don’t actually watch a lot of TV, so I had never heard of this show Cash Cab on the Discovery Channel, but I did love Jeopardy to distraction growing up, so when I heard about this fun little trivia app, I just had to try it. I’ve since learned that there’s a game show that springs trivia questions on unsuspecting New Yorkers with the promise of cold hard cash if they can answer them correctly. The app doesn’t pay out dollar bills, unfortunately, but it does give you the same fun rush of the game. The game has you riding around to various New York tourist destinations, like the Chrysler Building, answering questions along the way. Before you start, you must pick a “friend” as a backup in case you get stumped on a question. All the “friends” have various knowledge specialties, but they’re usually not very helpful, so you have to choose carefully and hope that you don’t have any gaping knowledge holes between you. Once you’ve selected a destination, the cab will continue along that route without any detours until it gets there. 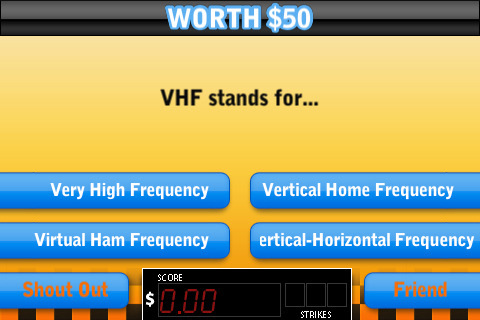 During that time, you can attempt to correctly answer as many straightforward trivia questions as you can. You’re selecting from multiple choice options, which helps, but be careful, because it’s three strikes and you’re out. If you’re stumped, you can try “Shout Out” to your friend for help, just remember, that can backfire. Occasionally there are “red light challenges” where the cab is stopped and you have 30 seconds to select which answers fit a certain criteria. For example, “Which of these are names from Snow White and the Seven Dwarfs? Sleepy, Grumpy, Pinocchio, Kevin, Doc, or Ginger.” And if you manage to reach your destination, you have the option to risk it all and double your money by answering a video question. Now, I really liked the premise of the game, but the app has a number of problems, the biggest one being overall stability. The Cash Cab likes to crash, so be warned. Second, it’s riddled with technical glitches. For example, videos still persist on playing with sound, even if you’ve totally muted your phone. Third, there just aren’t a whole lot of questions included, which severely limits the replay value. There are additional question packs for sale, but considering the already much-too-high purchase price of $4.99, it just doesn’t seem worth it. If you’re a major fan of the show or just really love trivia, I can see Cash Cab being a fun little diversion, but for everyone else, there’s just too many technical issues and not enough content to make it worthwhile for the price. AppSafari review of Cash Cab was written by Tracy Yonemoto on September 10th, 2010 and categorized under App Store, Games, Puzzler, Strategy. Page viewed 6579 times, 3 so far today. Need help on using these apps? Please read the Help Page.